NEW YORK, December 20, 2018 /3BL Media/— To capture the sum of the social investments and impact made by businesses around the world, CECP has released the year-end edition of Investing in Society, the industry’s annual report providing a comprehensive look back at the biggest trends and insights that defined the year. The all-digital and interactive report covers the five focus areas of Priorities, Performance, People, Planet, and Policies. Developed from CECP’s original research, thought leadership, findings from the Giving in Numbers: 2018 Edition, thousands of l discussions with more than 200 of the world’s largest companies, and engagement with leading experts and practitioners, Investing in Society is a 360-degree view of the corporate sector’s role in solving some of the world’s most pressing issues. This insights collection delves into what actions companies are taking to identify and effectively meet stakeholder needs, and how leading companies are striving to build a better world through business. PRIORITIES: While companies and their leaders are expected to speak on pressing socials issues, companies are taking a more measured and thoughtful approach to appeal to a broader diversity of opinions, points of view, and set of stakeholders. Corporations are approaching issues in collaboration with other companies and nonprofits, showing a united front on issues that make sense given their skills and expertise. Companies are considering their long-term business plans as they identify megatrends that require their activism. PERFORMANCE: CECP’s Strategic Investor Initiative continued to scale its efforts to provide a venue for CEOs to share their long-term strategic plans with audiences of long-term investors with nearly 30 CEOs from companies including Johnson & Johnson, Humana, BD, Medtronic, and Unilever making CEO Investor Forum presentations to investors representing more than $25 trillion in AUM. 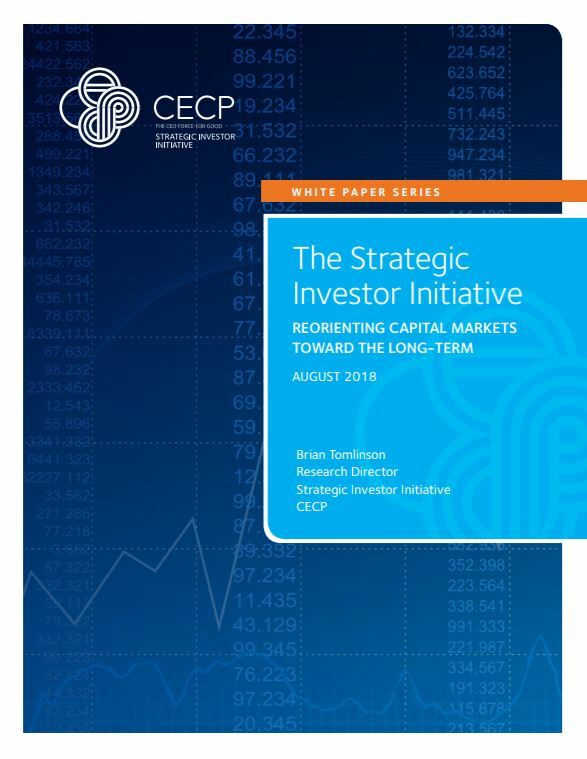 Recent research from SII and KKS Advisors has demonstrated a reaction to a CEO-presented long-term plan and is evidence that the audience of institutional investors finds the information in these presentations’ decision-relevant. PEOPLE: CECP, Imperative, and PwC have published new research on the employee experience around purpose, higher meaning, and fulfillment at work. A staggering 96% of surveyed workers believe that achieving fulfillment at work is possible, and they see their role in making it happen. PLANET: Companies recognized their potential to help in times of crisis after 2017’s unusually devastating run of natural disasters, along with the need for customized, disaster-specific responses. In fact, Giving in Numbers found that Disaster Relief was the program area that increased the most in 2017, doubling in terms of aggregated cash contributions and tripled in terms of median cash giving versus 2015. POLICIES: Companies are concentrated on ensuring effective corporate governance through top-line decisions, such as management responsibilities, internal incentives at the executive level, and employees’ rights. Research has demonstrated that companies with more diverse boards produced a higher return on equity, and companies agree. 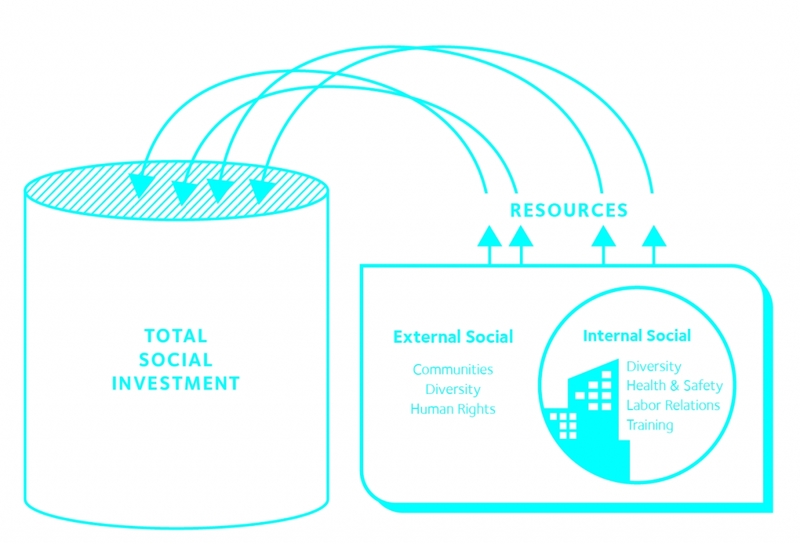 As the Executive Letter to Investing in Society, CECP also recently released the organization’s annual trends, which provide a thorough analysis of some of the biggest developments in the corporate social investment field in 2018. These five trends -- Employee Power, Collaborative Advocacy, Responsible Tech, Long-Term Growth Going Mainstream, and Impact Measured -- dovetail with the five focus areas explored in Investing in Society, offering further supporting evidence that companies are making decisions that consider their role in society and ability to effect meaningful change where it’s needed most. The final 2018 edition of Investing in Society is available for free on cecp.co. Note to Editors: CECP can coordinate interviews with Daryl Brewster, CEO, and Carmen Perez, Director, Data Insights, who are available for comment on the Investing in Society. Please contact Jackie Albano, jalbano@cecp.co to arrange interviews. CECP is a CEO-led coalition that believes that a company’s social strategy — how it engages with key stakeholders including employees, communities, investors, and customers —determines company success. Founded in 1999 by actor and philanthropist Paul Newman and other business leaders to create a better world through business, CECP has grown to a movement of more than 200 of the world’s largest companies that represent $6.2 trillion in revenues, $18.4 billion in societal investment, 13 million employees, and $15 trillion in assets under management. CECP helps companies transform their social strategy by providing customized connections and networking, counsel and support, benchmarking and trends, and awareness building and recognition.